My experience with anthropomorphic animal-creatures is mostly positive, but also rather childish. I loved Saturday Morning Cartoons like Teenage Mutant Ninja Turtles and Ducktales. Creating humanoid animals and assigning them familiar human traits and livelihoods is a classic story-telling device that speaks especially well to children and young adults. 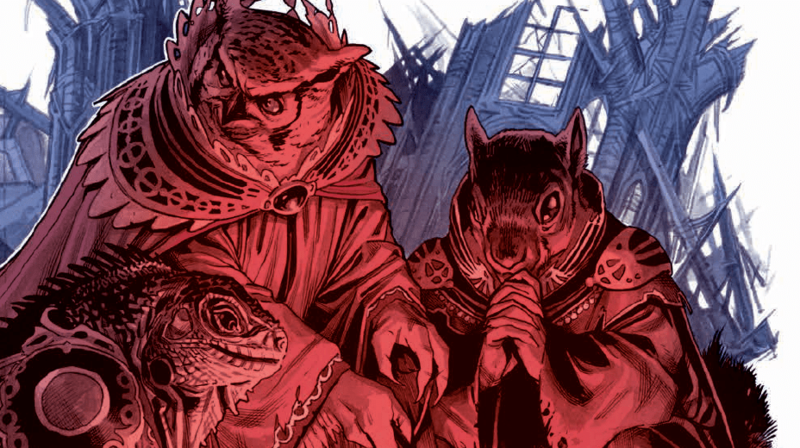 The Autumnlands: Tooth and Claw eschews most of the familiar trappings by throwing its huge variety of creatures into a far-flung future of magic spells, floating cities, and racial divides. The new series from Image Comics also contains a decidedly mature tone with language and violence akin to your favorite swords and sorcery HBO show. While the story-telling feels more suited to a traditional novel format (complete with mini-short stories accompanying each issue), the incredible artwork and intriguing world-building create a visual feast and a fun introduction to this strange new world. At just over fifty pages, the massive first issue has the difficult task of drawing you into this fantasy world (which may actually be a post-apocalyptic Earth, after humanity wiped themselves out) while also introducing the main characters and kicking off the story with a city-shattering event. 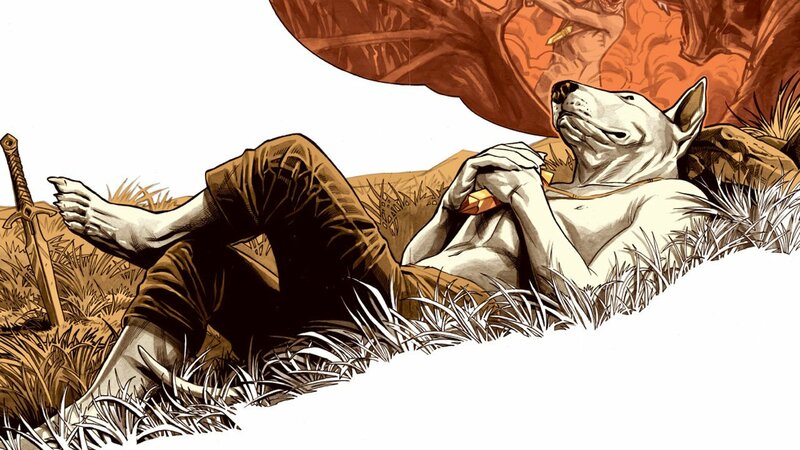 The story mostly follows Dunstan, a young dog (a bull terrier, if I know my dog breeds) who lives in the magical floating city of Keneil along with a smattering of other races. He lives a pious, contemplative life with youthful energy. His father works as trademaster and Dunstan accompanies him as he deals with the ‘lesser races’—a tribe of bison that live below on the plains. 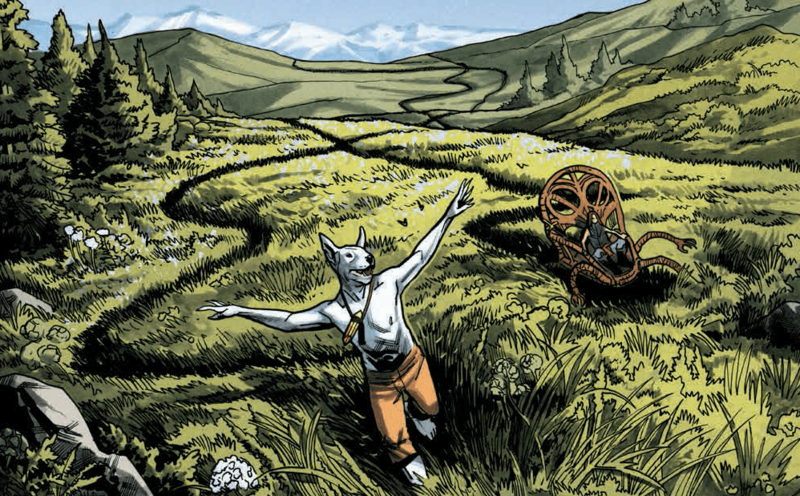 The Autumnlands doesn’t attempt to spell out its world, but trickles in information at a teasing pace. We learn that magic in their world is fading out, and a conclave of wizards gathers to discuss the ramifications like a UN summit meeting. Drawing any scene with dozens of characters can get tricky; when those characters happen to be crocodiles, birds, giraffes, lizards, and walruses, it’s nothing short of remarkable. Each wizard is garbed in intricate robed costumes that would make Hollywood costume designers take notes. Every panel of Ben Dewey’s art is sketched with such loving detail that it took me twice as long to read as any other comic. Gharta, a world-traveled warthog wizardess, suggests they pool their power together to bring forth the Champion, a legendary folk hero from their past. Her views are met with skepticism and we see a familiar clash of conservative and progressive politics. Eventually, she gathers a team together, and the resulting event creates a cataclysm that changes their world. The first issue is an amazing draw, establishing (but not explaining) the political and magical systems as well as glimpses of the wider world. The rest of the volume chugs along a bit slower than I would have liked. Wizard councillor Sandorst, a haughty owl (aren’t they all), represents the usual clichéd dissenting politician. His scheming political and social machinations would feel right at home in Game of Thrones. The coyote trader Goodfoot is a fun addition as she plays both sides to line her own pockets. Plus, she rides a giant cockroach and wears feathers in her hat. A few minor characters, like the hulking bulldog blacksmith Bhord, are mostly used for background. The Champion, Steven Learoyd, channels a Conan the Barbarian vibe. He’s crass, rude, and flippant, with a barbaric savagery and cold practically that makes him both interesting and repulsive. He’s also a human (which the volume unfortunately spoils on the cover) from an unspecified tech-savvy but war-torn past, shocking our animal-filled world that had all claimed him as a member of their own species. Volume 1 adheres closely to its plot of the beleaguered survivors of the cataclysm and their stranded plight with an angry bison army right next door. The drama between Sandorst and Gharta go down familiar paths while we get the first taste of Dunstan and Learoyd’s budding respect and friendship. The end of issue #6 nicely wraps up the immediate plot with an action-packed set piece, while still leaving us with a fun cliffhanger. The concept of a magic-filled world of complex animal societies that sprung from a dystopian sci-fi world of humans is absolutely fascinating. Though, at times I found the focus on petty drama and clichéd characters frustrating, as I wanted to learn more of the wider setting and background. Thanks to the amazing artwork and the rich groundwork laid out, I have high hopes for the future of this incredibly unique series.